Developers at Apple has shared latest statistics for the iOS 9 adoption and unlike Android, the adoption of the latest iOS version is always on the top the same month. This time also newly launched iOS 9 has pegged back to claim the highest iOS version adoption of all versions. Of all the iDevices, there are 57% handset and tablets running iOS 9 [this includes iOS 9.0.1 and iOS 9.0.2]. 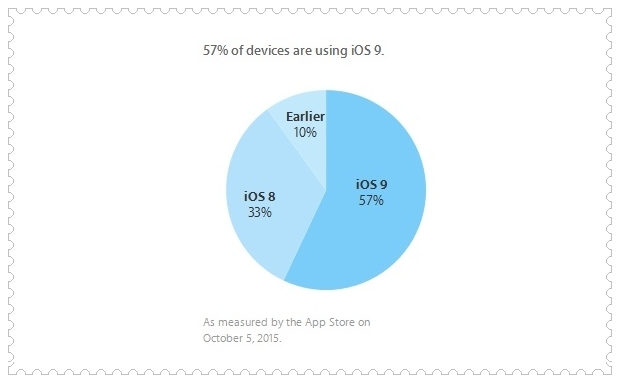 Still there are 33% of iDevices running on iOS 9. The higher percentage might be due to the problem of updating to the latest iOS 9 version for the 16 GB models of the device. Some might not have enough memory to carry out the update, while some has stayed on iOS 8.4 due to early release bugs of iOS 9. Interestingly there are 10% of devices running iOS 7 and lower iOS version. To increase the iOS 9 adoption, iPhone 4S was included in the update roll out plans and many of the users did update to the latest build by Apple. The iOS 9 adoption in coming month will continue to grow as we approach a stable release by Apple in coming days.